The NFL (which, as Jerry Glanville once famously quipped, stands for “Not For Long”) is in a constant state of turnover. Rosters are constantly being shaken up via free agency, the draft and trades, often leaving just a handful of players who survive regime changes in a city. With this in mind, we took a look at each team to find the longest-tenured position player on each roster (much to the chagrin of our own Gordon McGuinness, kickers, punters and long snappers were excluded). Not surprisingly, many of the players have been able to survive multiple regime changes by being some of the best players not just on their perspective rosters, but in the entire league. Conversely, several of the younger teams in the league have turned over their entire rosters in recent years, leaving no one remaining from as early as five years ago. After rolling through the AFC on Monday, now it’s the NFC’s turn. This list is loaded up on offense, highlighted by six offensive linemen and five QBs. 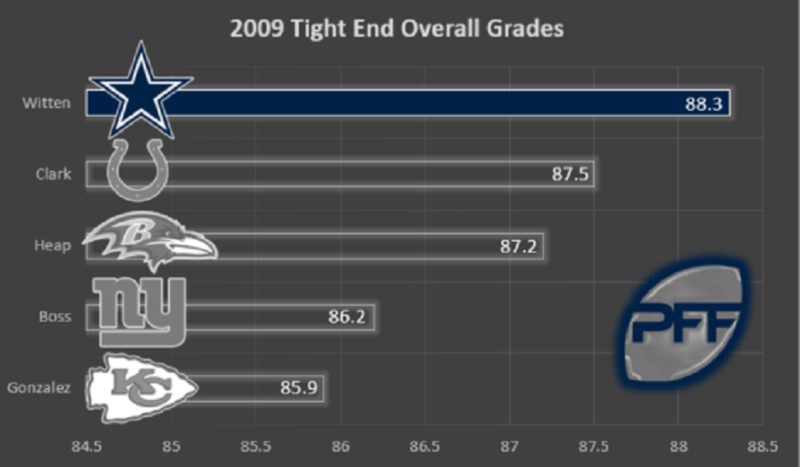 Witten is the only tight end to make the NFC’s list, and has been one of the most consistent performers at his position over the past decade. His best season may have been 2009, when he led all NFL tight ends in overall grade (88.3) and run-blocking grade (91.3). 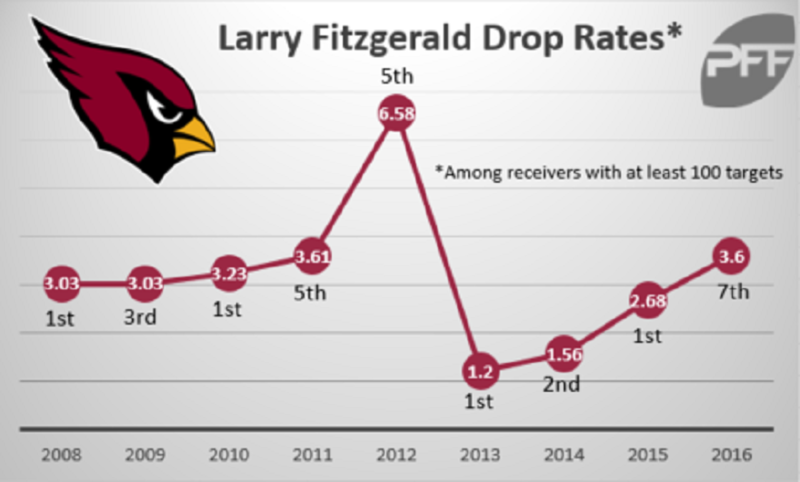 Fitzgerald has been a part of a number of great teams (and some pretty poor ones as well) during his long career with the Cardinals, and regardless of QB play, he has consistently been a top performer. 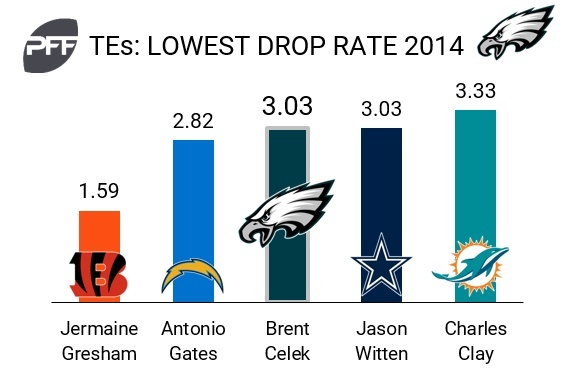 His hands have been the trademark of his game, as he has finished with the lowest drop rate among NFL receivers with at least 100 targets four times since 2008, and has never finished lower than seventh in that span. Manning may have had a rough 2016, but he has certainly had his share of outstanding seasons, highlighted by the Super Bowl run of 2011. His play that season was highlighted by his consistency under pressure, as he posted the second-lowest sack rate in the NFL, and was at the head of the class in adjusted accuracy at 70.6 percent. 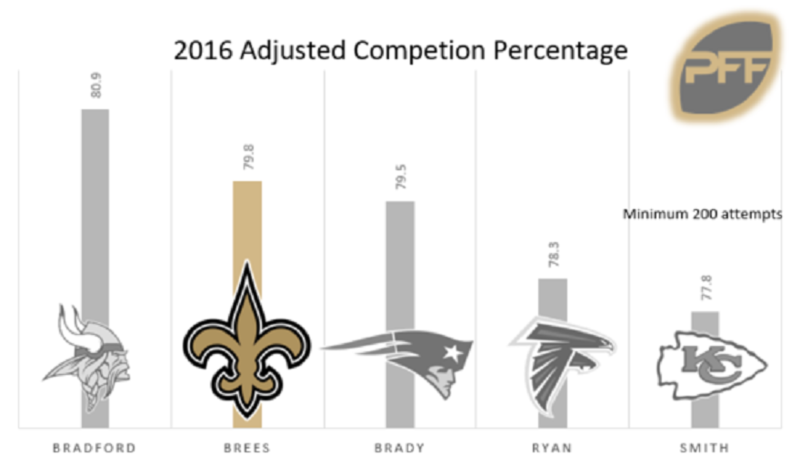 Brees remains one of the best all-around players in the game, as he comes in at No. 47 on our list of top 50 players for 2017. 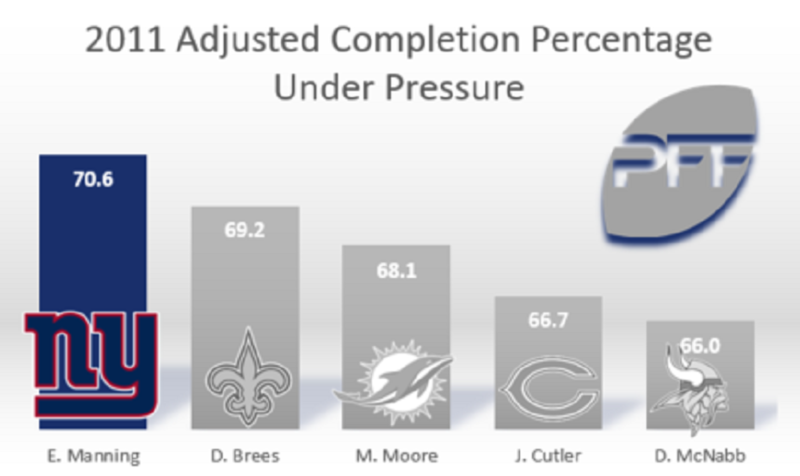 He finished 2016 second in overall adjusted completion percentage, also finishing in the top five in accuracy on deep passes, when under pressure and in a clean pocket. Still in the prime of his career, it’s hard to believe Rodgers was drafted by the Packers 11 years ago. 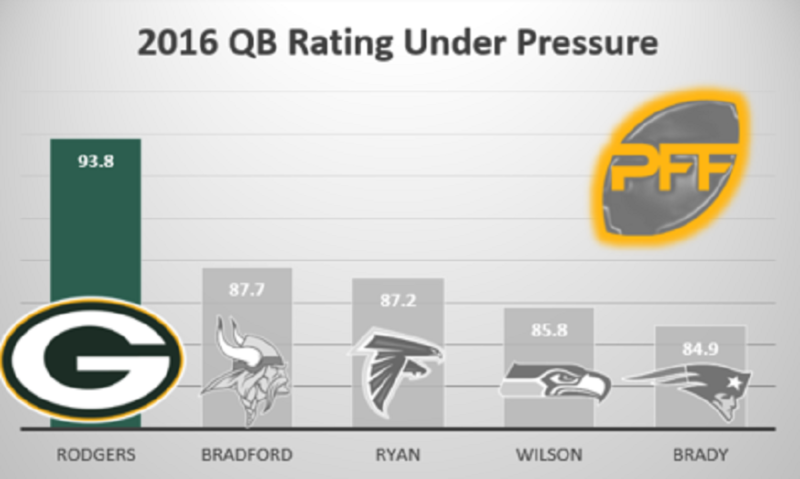 Rodgers was outstanding under duress in 2016, as he threw 12 touchdowns to just one interception when faced with pressure, and led the league with a passer rating of 93.8. A fifth-rounder in the 2007 draft, Celek graded 71.4 or higher every season from 2007 until 2015. His 484 snaps played in 2016 were also his lowest since his 2007 rookie year, with Zach Ertz supplanting him as the No. 1 tight end on the Eagles roster. Celek finished 12th or better in PFF grading among tight ends in 2009, 2011, and 2013, and has his best year from a production standpoint in 2009, when he had 76 receptions on 106 targets for 968 yards and 8 touchdowns. He finished third in yards per route run at the position that year at 2.24, behind only Antonio Gates and Jermichael Finley. Robison can seem a bit of an afterthought considering the depth of talent on Minnesota’s defense, but he’s been a highly consistent pass-rusher throughout his career. Finally earning a starting role in 2011 after being a rotational player his first four seasons with the Vikings, he has tallied no less than 49 total pressures in every season since. 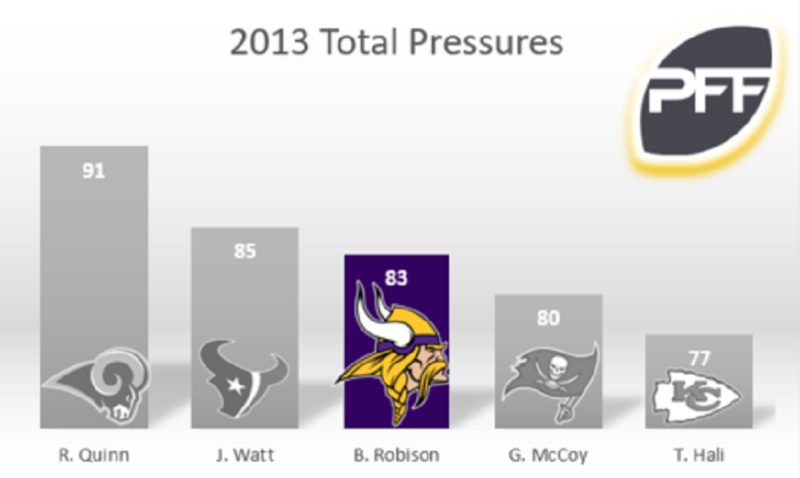 2013 was his best effort, as he finished third overall in total pressures, and seventh among 4-3 defensive ends in pass-rush productivity. Kalil has had a rough go of it in recent years — subpar years by his standards in pass protection in 2014 and 2015 — and a shoulder injury that landed him on injured reserve after Week 11 of 2016, but he has otherwise been a strong performer throughout his decade in Charlotte. 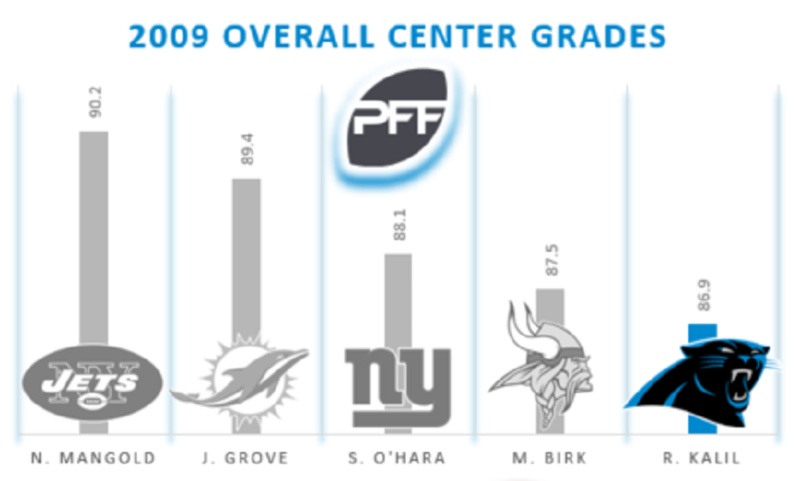 2009 was likely his best all-around season, as his 86.9 overall grade was fifth-best among centers and he also finished in the top 10 in pass-blocking efficiency with just 10 total pressures surrendered. The 49ers offensive line quickly turned over from one of the best in the league to one of the worst, but Staley remains a steadying force at left tackle. 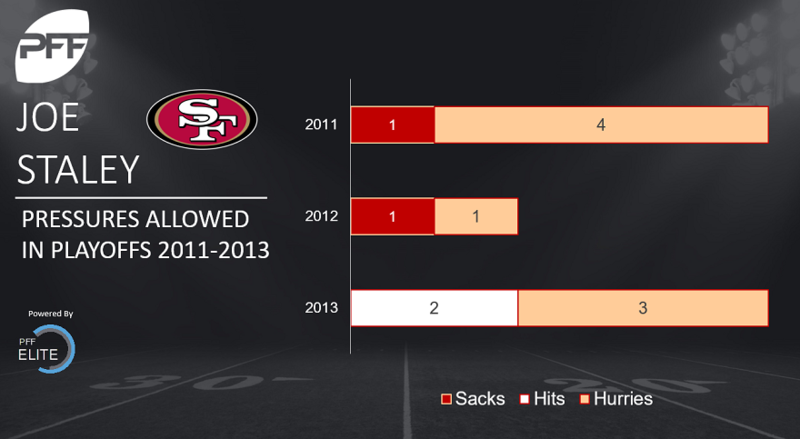 Staley has been at his best when it mattered most in his career, as he combined to give up just two sacks and two QB hits in San Francisco’s three deep playoff runs between 2011 and 2013. Hall’s best days may have been at the beginning of his career with the Falcons, but he made an immediate impact in Washington after being released by the Raiders and signed by the Redskins in early November of 2008. In the final seven games of the season for Washington, Hall yielded just 17 catches on 34 throws into his coverage for just 137 yards and no scores while he picked off two passes and broke up another five. 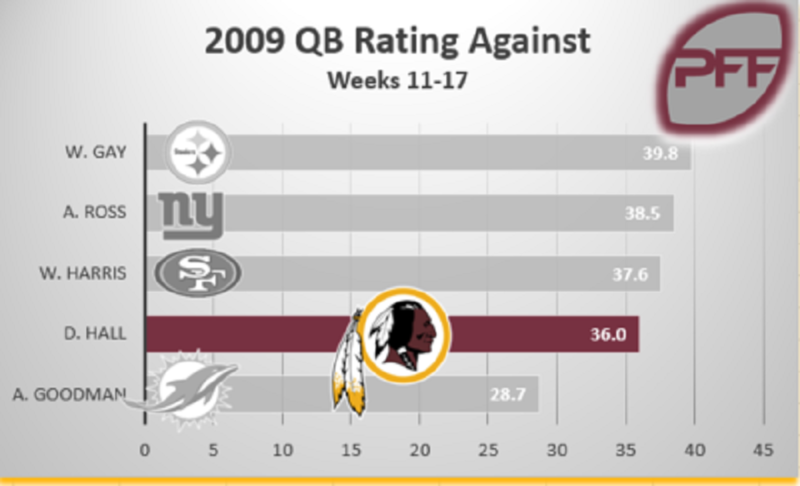 Opposing QBs had a rating of just 36.0 when testing the D.C.-version of Hall that season, the second-lowest rating in the league over the final seven weeks. While the 2016 season ended in nightmare fashion for the Falcons, Ryan had unquestionably the best season of his career. 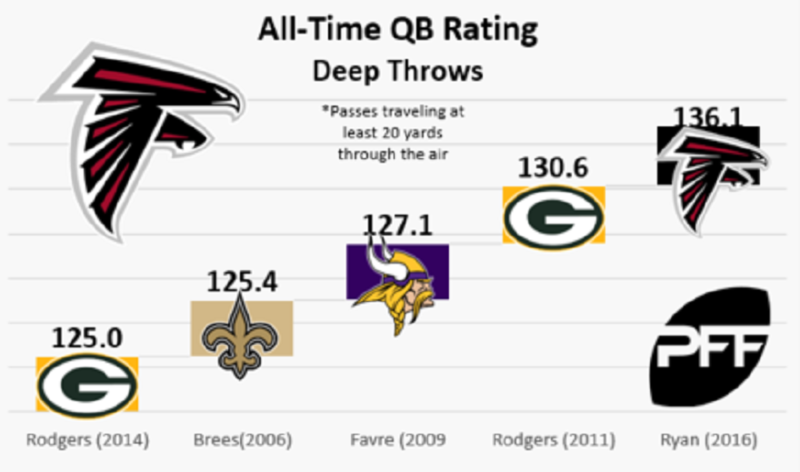 A huge part of his success last year was his downfield throwing, as he finished with the second-best adjusted accuracy on deep passes, and a ridiculous QB rating of 136.1 when throwing the ball at least 20 yards downfield, the highest mark in the PFF era (since 2006). While he still has yet to lead the Lions to victory in a playoff game, Stafford played some of the best ball of his career in 2016 until a finger injury hampered him down the stretch. 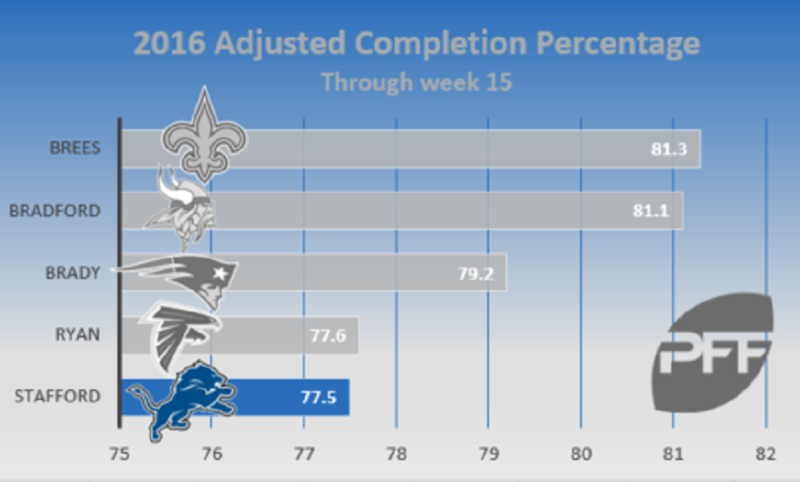 Through Week 15, Stafford ranked fifth in the league with an adjusted completion percentage of 77.5 percent. 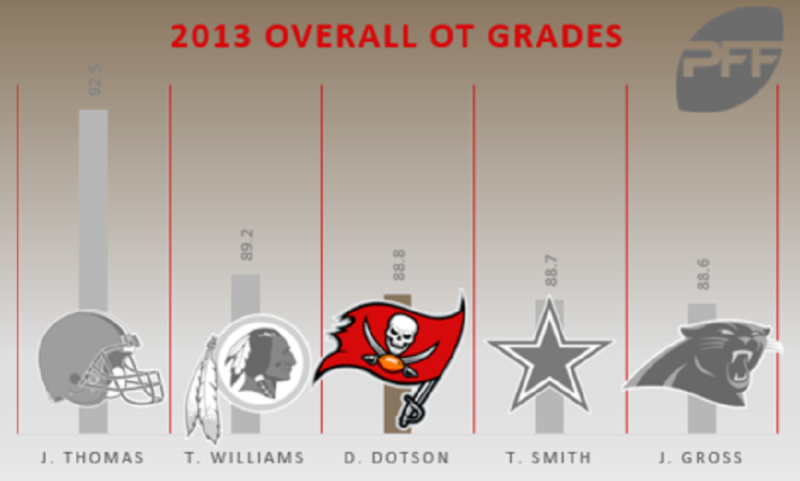 Dotson isn’t likely the first name that comes to mind when discussing the best right tackles in the game over the past five years, but he has been one of the most consistent performers on the Tampa Bay’s offensive line in that stretch, in particular as a run blocker. He put it all together in 2013, when his 88.8 overall grade ranked first among all right tackles and third overall at the tackle position. Thomas was having one of the best seasons of his career before his 2016 campaign ended with a Week 13 injury, as he through 12 games had given up just 127 yards into his coverage and had a QB rating against of just 43.0. 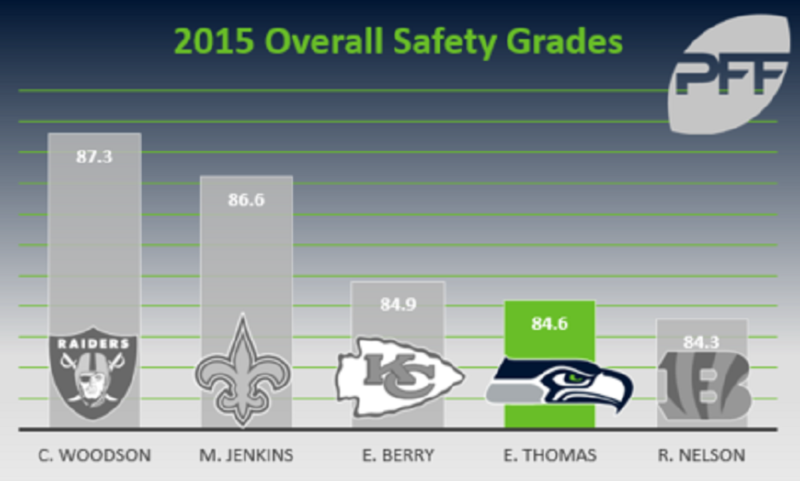 2015 was also one of the strongest years of his career from a coverage perspective, as his 84.6 coverage grade ranked fourth among all NFL safeties. 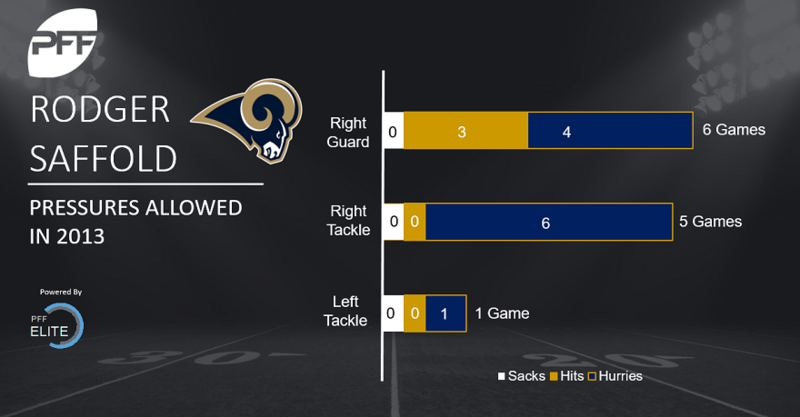 Saffold has started games at every offensive line position but center during his seven years with the Rams, and his best season was 2013, when he had starts at right guard and both tackle spots. In his six games that season in which he played either tackle position, he did not yield a sack or a hit. The Bears’ front office has worked hard to completely turn over the roster the past two offseasons, and as a result Long is the only player on the current roster to have played for Chicago in each of the past four seasons. 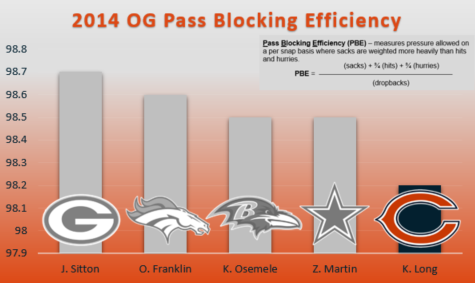 His sophomore campaign of 2014 was his best to date, as he yielded no sacks and just two hits, finishing fifth among all guards in pass-blocking efficiency.